Beijing is a great place to sample different Chinese cuisines and I’ve been lucky to try food from all across China in the capital city. Over the coming weeks, I’ll be posting about Peking Duck at Ya Wang, posh Sichuan at South Beauty, dumplings at Shun Yi Fu, Shanghainese treats at Xiao Nan Guo and my blogging nightmare at the 'Yunnan Embassy'. In the meantime to whet your appetite, this post rounds up the good, bad and the ugly of Beijing. 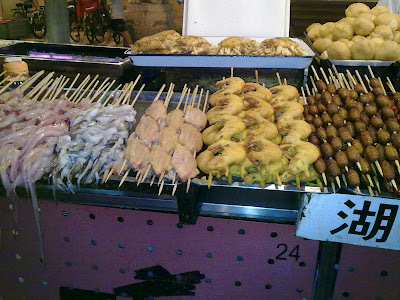 Donghuamen Night Market is definitely bad and ugly. It sells scorpions, starfish and indeterminate meat on skewers. If that doesn’t put you off, the neglect of basic food hygiene should. I’ve yet to eat here (not even when pissed) and you shouldn’t either. About 5 minutes walk away is Wangfujing Snack Street with numerous stalls selling Sichuan food, Xinjiang kebabs (chuan‘r), beef noodles and various xiao chi (small eats). It’s cleaner here and some places have tables. But I think the food quality has gone downhill (or I’ve become more fussy !). My bowl of dan dan noodles was very disappointing. I don’t think street food in Beijing is all that good and there’s certainly nothing here that comes close to the night markets of Taipei. 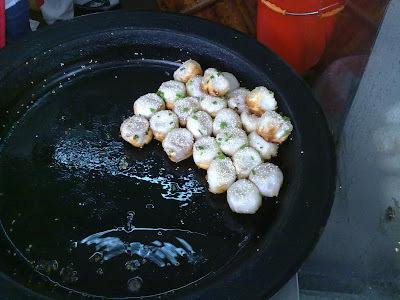 Shanghai’s famous Wujiang Lu is also pretty lacklustre for street food although there is a branch of Yang’s Fry Dumplings. I’m also not sure whether it’s me being choosy but there seems to be a lack of quality Cantonese restaurants in the capital. My one foray into dim sum confirmed my suspicion that you need to go to 5-star hotels to enjoy quality Cantonese food in Beijing. Of the places I've eaten in, I can recommend Noble Court at the Grand Hyatt Hotel. Now as Mr Noodles, you probably thought I’d be banging on about the noodles in Beijing but to be honest, I lucked out a bit on the noodle front as I failed again to fall in love with zhajiangmian (literally means ‘fried sauce noodles‘). 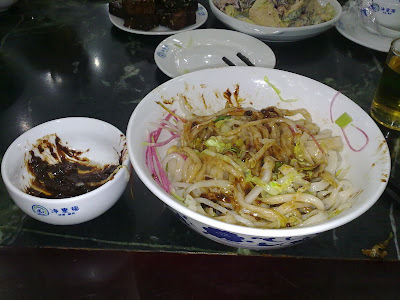 This classic Northern Chinese dish of hand-pulled noodles mixed with a bean paste and various shredded vegetables like cucumber, radish and spring onion ought to be food from the gods. But no matter how hard I’ve tried, I’ve never agreed with this dish. It wasn’t all bad as the restaurant I tried it in had a good vibe, cheap beer and the rest of the food was OK if somewhat unmemorable. You know the drill by now, look for the Chinese sign….. Unfortunately, I have no idea where this restaurant is located except that it was near Houhai, a great place for drinking - loads of bars with outdoor seating by the lake. Drinks are much cheaper than Shanghai (about RMB 35 for a beer). If you fancy, you can live out your Freddy Flintoff fantasies by hiring a pedalo or you could go on a proper boat if you’re going to be boring. On this visit, I didn't make it to some of my favourites such as the trendy Taiwanese place, Bellagio and South Silk Road which specialises in Yunnan cuisine. I also missed out going to Ghost St, a mile long drag full of inexpensive restaurants - it's lit up like a Christmas tree and strangely reminds me of Manchester’s Curry Mile. Hot pot (huo guo) was also off the menu too as we rolled up to a building site where the restaurant used to be. I'm also gutted that I didn't get to try Shanxi noodles at Noodle Loft. I’d love to hear from you if you have any Beijing tips you want to share. In particular, recommendations for any Chinese cuisines that I haven't covered. 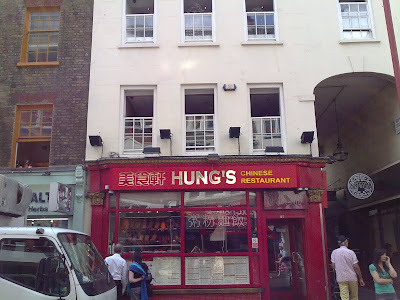 I thought I’d slip in a London restaurant review inbetween my posts on China although Hunan is a Chinese restaurant. It’s a bit posh as you might expect with a Pimlico Road address and being 2 minutes from Sloane Square tube. Famously (or infamously), there is no menu here and you leave yourself at the mercy of the chef although you are given a chance to state your dislikes. Although we knew there’d be dishes we might not like, we said ‘bring it on’ albeit politely, we were in Belgravia after all. The lack of menu is compensated by a weighty wine list. We ordered a 2008 Schloss Gobelsburg Gruner Veltliner (£29) which swiftly arrived with some nibbles of nuts, kimchi and cucumber. I’m no wine expert but I thought it complemented the food very well. Not long after, the first of what turned out to be 16 courses arrived. Everybody loved the minced pork & ginger soup served in a bamboo mini-keg and the lettuce wrap with minced chicken was also well received if a tad generic. The next course was described as water-cooked pork dumpling (shui jian bao). With it‘s crispy bottom and vinegar dip, it reminded me a bit of the sheng jian bao I had in Shanghai although these dumplings were soupless. I’m sure I’d have liked these more if I hadn’t just returned from China but I couldn’t help comparing them to the dumplings in Shanghai. Although I was a tad disappointed, no one else was. A quick succession of dishes then arrived, salmon rolls, crispy beans with chilli, jellyfish rolls, pig’s ears & pig’s tongue and king prawn & minced pork rolls. Of these dishes, the crispy beans were the star turn with its moreish light tempura batter. The pig’s ear didn’t have many fans although the accompanying pig’s tongue was wolfed down. My personal favourite was served next, spicy frogs legs, which reminded me of a similar dish I once had in a Hunanese restaurant in Beijing. The legs had a light crispy coating and were served with bamboo shoots, chilli and spring onion. The next dish was easily the worse of the evening. The chilli beef was like a refugee from a bad take away, tough chewy beef served in a gloopy sauce. After the beef nightmare, things picked up with the steamed duck with ginger and spinach rolls. Then some more offal in the form of Chinese 'haggis', well that’s what the waiter called it after we sent him back to find out. We weren’t sure what this dish consisted of but we weren’t fans of the texture. The chilli sauce it was served with was also too potent overpowering the taste of the dish. None of us really liked it although it was more to do with personal taste rather than the dish being a complete nightmare like the beef. It was at this point (13 courses in) that we asked to stop. However, we were told there would be two more courses. The fried baby squid was spoiled a bit by its sauce but I have no complaints about the excellent steamed scallops served on top of cucumber filled with minced pork and topped with garlic. So after 15 rounds, we said ‘no mas’ and asked about dessert. I’m not sure if we were allowed to choose but we only asked for the toffee apple with ice cream and toffee banana with ice cream with the emphasis on ice cream. Anyway the one dessert we didn’t want was brought out on the basis it was more ‘Chinese’. It undoubtedly was but we did say we didn’t want it. The rogue dessert was sent back and our order was wheeled out but without the ice cream. If I gave marks out of ten, I’d deduct a point for this slightly farcical end to our meal. The only other (minor) grumble was the inadequate description of the dishes in English or Chinese. If you’re serving what is essentially a tasting menu, it’d be nice to have an description of each dish and in some cases how best to eat it. It’d also have been good to be given more warning as to when we might want to stop. Dinner for four cost £240 including two bottles of wine and 12.5% service. If you describe it as a Chinese meal then it seems pricey but if you think of it as a tasting menu in a Belgravia restaurant, it seems reasonable. Lastly, many thanks to my dining companions. It was my first grown-up London restaurant review and I hope the photography, incessant questioning and note making weren’t too intrusive. Verdict: I enjoyed the element of surprise at Hunan but it isn't somewhere you'd return to regularly unless you had deep pockets. Having said that it's worth going for a special occasion or a smart business dinner. Other Stuff: The Fox & Hounds is a great pub to meet in before or after the meal as is the Ebury Wine Bar if you prefer wine ! Now you may be mistaken in thinking that all I did in Shanghai was stuff my face with xiao long bao and sheng jian bao. 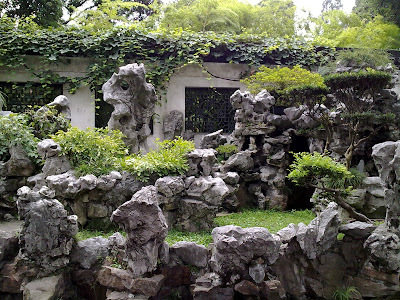 You wouldn’t be far wrong but here’s a round-up of the rest of the places in Shanghai that I’d return to. They're all in the French Concession near where I stayed. Cantonese food is very popular in Shanghai and there are loads of casual places as well as posher restaurants if you need a fix. Bifengtang is a chain restaurant not dissimilar to the cha chaan teng or caffs that you see in Hong Kong. There’s a bilingual menu with a wide selection of Cantonese one-plate dishes, congee, soup noodles, fried noodles and dim sum with some Shanghainese faves. It’s pretty unremarkable except for their dim sum dish of prawn spring roll wrapped in cheung fun (RMB 16). The contrast between the different textures of springy prawn filling, crispy spring roll pastry and soft rice noodle roll exterior were a joy. 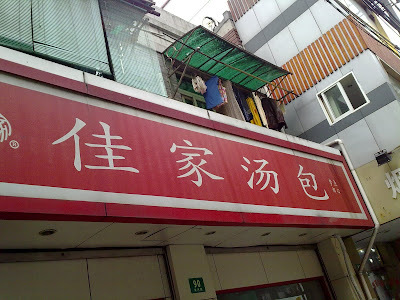 I went to the Changle Lu branch which is open 24 hours a day. Even better Cantonese fare is available in the café inside the Cathay Theatre on the corner of Maoming Nan Lu and Huaihai Zhong Lu. It doesn’t have an English name but you can see the Chinese name from the name card on the left hand of the below photo - just follow the signs and go upstairs. They have an extensive bilingual menu and there’s also a Cantonese BBQ counter (extra marks for authenticity). The stand out dish here was Three Treasures Congee (RMB 28) served in a claypot. The three treasures in question were fish slices, crab legs and prawns with the added bonus of a fourth treasure of clams ! This was the best congee I’ve had in a long time and was better than the stuff I had in Hong Kong and Guangzhou earlier this year. 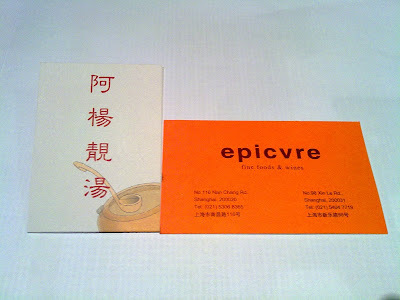 A very un-Chinese place was the Epicvre which I discovered whilst strolling along Xinle Lu. It’s a fine food and wine shop with a French bent. There’s a few tables for punters to snack and drink. I didn’t eat here but they do serve quiche type things and salads. The reason to come here is to enjoy their fine wines and my nicely chilled glass of Sauvignon Blanc (RMB 60) really hit the spot after walking around in humid 30C heat. Now Shanghai is an expensive city to drink with beers costing up to the equivalent of £6 - £7 which is double the going rate in Beijing (or London for that matter). 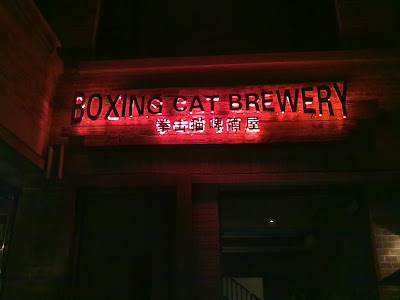 So I was pleased to track down the Boxing Cat Brewery on the Fuxing Xi Lu, a relatively quiet corner of the French Concession. This microbrewery sells pints at around RMB 45 (RMB 35 during Happy Hour) and it‘s a great place to drink outdoors. I didn’t eat here but they do American food including weekend brunch. If xiao long bao is the elegant pretty Shanghai dumpling then sheng jian bao is it's more 'obvious' cousin with it's alluring crispy pan fried base and fragrant sesame & chive topping. After reading this post in Appetite for China, sheng jian bao (SJB) rose to the top of my must-eat in Shanghai list. SJB are similar to XLB in that they have a minced pork and soup filling and are served with a vinegar dip. Topped with sesame seeds and chives, they're cooked in giant batches in a pan covered with a wooden lid. This steams the SJB whilst simultaneously frying the base to a crisp. You'll see the finished article at the front of 'hole in the wall' joints throughout Shanghai. 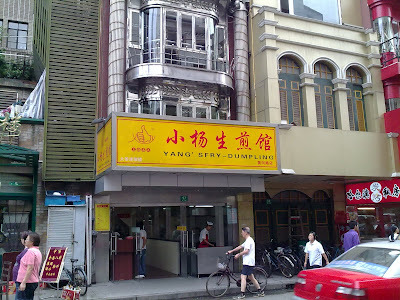 Huanghe Lu is truly blessed as Yang’s Fry Dumplings is across the road from Jia Jia Tang Bao. 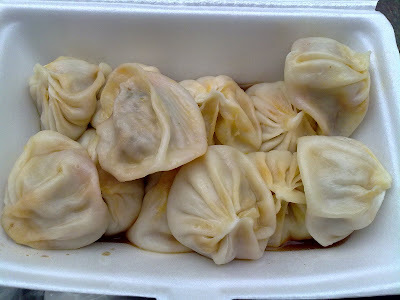 Whilst there was other stuff like noodles and won ton soup available, everyone ordered sheng jian bao (RMB 4.5/4pcs). I was very lucky as I had the first serve from a fresh batch but this brought its own perils as I had to wait for them to cool down. If you think XLB can scald then SJB can really scald ! Once cooled, I ate the SJB like I would XLB taking care not to squirt soup everywhere. Yang's SJB were the best I tried as other examples were too greasy with oil rather than soup in the filling. 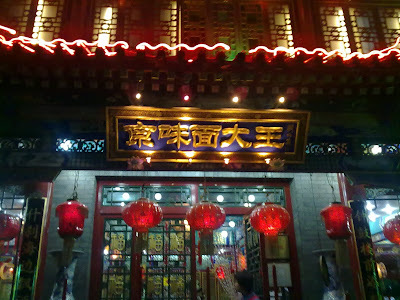 The only other place worth mentioning is a place in the former French Concession on Shanxi Nan Lu between Jinxia Lu and Julu Lu. No English name but I did take a photo of the shop front. The sheng jian bao (RMB 4/4pcs) were good rather than great but frankly I couldn’t give a toss after I found out they served large bottle of beers for RMB 4 (that's less than 40p if you‘re wondering). Seeing that a pint in Shanghai can cost over the equivalent of £7 in a trendy hellhole expat bar, the beer was a must. Now as it doesn’t take long to polish off some bao, I ended up nursing said beer. This led to a scolding from the fearsome boss lady (in Shanghainese I think). 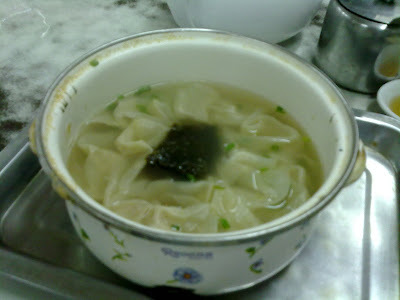 To avoid further grief I ordered their wonton soup (RMB 4). I would have probably ordered this anyway as seeing the wontons being made in the open kitchen made me more hungry. Unlike Cantonese wonton, the pastry is thicker and the filling smaller. But that’s irrelevant as the soup was the winner here with the block of seaweed imparting a wonderfully deep umami hit. They also serve cold noodles here with a variety of toppings but despite being Mr Noodles, I can’t say I enjoyed these when I returned for breakfast the next day. Verdict: Sheng jian bao is a must-eat in Shanghai and Yang’s Fry Dumplings is the place to go. If you happen to be in the French Concession then pop into the little ‘hole in the wall’ for bao, beer and wonton soup (just don't upset the boss !). Shanghai is the home of the xiao long bao, the famous dumplings with a soup filling. Eating these in Shanghai excited me more than any sightseeing trip ! For the uninitiated, World Foodie Guide explains what these dumplings are all about. I decided to do a ‘David & Goliath’ tasting of xiao long bao or XLB by going to the homely Jia Jia Tang Bao and the world famous Din Tai Fung. I also tried XLB at a couple of other places but they weren’t worth writing about (although the photo at the beginning of the post is of one of those inferior XLB’s). I decided to go off peak at 3pm in the afternoon but it turned out there was no off peak. All the tables were full and there was a crowd waiting outside for take away including a group of foodie pilgrims from Hong Kong. I had wanted to try the cheapest option of Pork XLB (RMB 7.5/12 pcs) but these had sold out so I went for Pork & Crab XLB (RMB 19.5/12 pcs). I couldn’t be bothered to fight for a table so I ordered take away in a polystyrene tray after dousing the XLB with vinegar. As I expected the XLB were very tasty, in particular I liked the hint of dried citrus peel (guo pei in Cantonese) in the filling. The skins were robust enough not to tear easily but at the same time weren’t too thick. My only complaint was that there wasn’t enough crab but I couldn’t really moan as 12 dumplings cost less than £2 ! If I hadn't tasted any other XLB, I would have been a happy man but two days before my trek to JJTB, I visited Din Tai Fung, Unfortunately, my photos were lost but their website has loads of pics and you can also learn about the rags to riches story behind this institution. 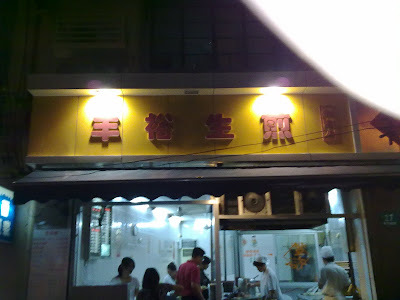 Although originally a Taipei based restaurant, there are now no less than 5 branches in Shanghai. I went to the Xintiandi branch which is very centrally located and ideal for a dumpling fix before being royally ripped off for an overpriced beer in a bar. The XLB come in either portions of 5 or 10 per steamer and unless you’re in a big group, I recommend ordering the smaller portion and whatever the size of your group, stagger your order to keep the dumplings steaming fresh. I sampled the Pork XLB (RMB 29/5 pcs) and the Pork & Crab XLB (RMB 43/5 pcs). The XLB were more polished compared to JJTB and they were pretty much perfect. So much so that they do actually look like the photo in the menu ! Pork & Crab XLB can sometimes be a joke in that there is barely a hint of crab or crab roe but not at Din Tai Fung where the generous use of crab roe almost made the dumplings too rich. If that wasn’t enough, they serve the best soup noodles too. The divine double boiled chicken soup with noodles (RMB 50) is a must order and if you don‘t fancy noodles, you can just order the soup. Even their Iron Goddess Tea (tieguanyin) was different class. Verdict: Go to Jia Jia Tang Bao for a snack whilst sightseeing and then push the boat out for a posh dinner at Din Tai Fung. 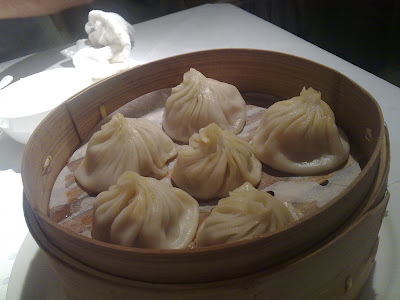 But be warned, you will bore people senseless about how the XLB in Shanghai are so much better than the ones in London. If only Din Tai Fung would open a London branch or if we could persuade the Jia family to relocate. 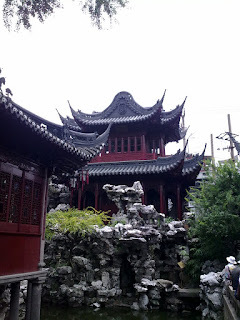 I’ll be blogging about my recent trip to Shanghai and Beijing over the next few weeks. Before going away, I like to do a bit of a research on what and where I’m going to eat. As this was my first time in Shanghai, I did a bit more planning than usual. The Chowhound boards are a good place to start but there are no photos and there’s just a bit too much 'one-upmanship' for my liking. Of the blogs, Appetite for China was invaluable - I just knew I had to check out the xiao long bao at Jia Jia Tang Bao and the sheng jian bao at Yang’s Fry Dumplings. For good fashioned print media, I found the Time Out Shanghai guidebook very handy. Unfortunately, I had a minor disaster in Shanghai as some little street urchin nicked my camera and about 3 days worth of food snaps. Consequently, there won’t be any separate Shanghai restaurant reviews. Instead, I’m going to summarise my trip in three posts supplemented with a few snaps taken on my phone. Worse thing is you’ll have to read my crappy prose instead of drooling at photos of food ! I was a bit more lazy when it came to researching Beijing as I'm a lucky sod who gets to go there often. Having said that, one of the first things I did in Beijing was pick up a copy of Beijing Eats by Eileen Wen Mooney. This excellent book is a Beijing restaurant guide and a crash course in regional Chinese cuisine rolled into one. It’s not available in the UK and I bought my copy at the Foreign Languages Bookstore on Wangfujing Dajie. World Foodie Guide has a great review of the book as well as loads of top tips for Beijing. Beijing is a great foodie destination and it's arguably the best place to visit if you want to sample lots of different cuisines from across China. I'm looking forward to sharing the best of my experiences. One final point to consider is the use of English names for Chinese food in these posts. The names I use may not always match up to the restaurant’s English menu (if there is an English menu). This is because 'Chinglish' is still prevalent and the attempts at English translation often end up as gibberish. So where possible I’ll use the generally accepted English name for a dish but failing that I’ll try to describe the dish as best I can in English. 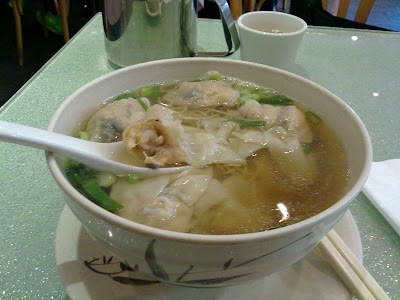 Being a newbie blogger, I’ve decided to play it safe and start with an old favourite, wonton noodles served at an old favourite, Hung’s on Wardour St (near the Chinatown arch). 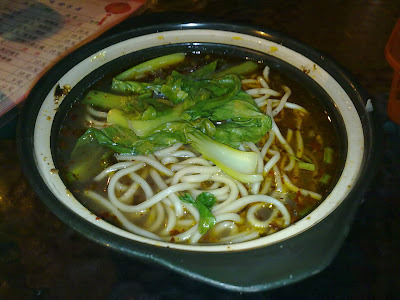 This is also the first instalment in my series of reviews on the London soup noodle scene. This place is my regular Chinatown haunt and it has barely changed in all the years I’ve eaten here despite a refurb and name change (it used to be called Crispy Duck). It might look tiny but it’s on three floors so don’t be put off if it seems full. Service is efficient rather than friendly although I swear I got a smile out of one of the waiters sometime in 2005. Whilst it won’t change your life, Hung’s wonton noodles (£4.50) tick all the boxes. The wontons have the right mix of prawn and fatty pork, they use the proper fresh egg noodle (san mein in Cantonese) and the broth isn’t MSG laden. It’s not a big bowl but compared to the miniscule portions that you sometimes get in Hong Kong, it's a supersize portion. Anyway, you get your money’s worth with six wontons. The photo is of their king prawn dumpling soup noodles (£4.80) which I returned to try a week later, these dumplings are bigger than their wontons and have more king prawn. They're known as sui gow in Cantonese or shui jiao in Mandarin. In my opinion, these are tastier than their wontons ! Verdict: Stump up the extra 30p and go for the king prawn dumpling soup noodle. Good for a light lunch or big snack when shopping in and around Chinatown. Other Stuff: Check out the window display of Cantonese BBQ - roast duck, cha siu (honey roast pork) and siu yuk (crispy belly pork) - ideal for takeaway. I’ve been following food blogs for a while now and after much umming and aahing, I’ve decided to enter the crowded London food blogosphere. There are so many great blogs out there, I'm stepping out with some trepidation ! I'm not sure how the blog will pan out but I don’t think I'll be doing too many recipes ! Most of the time, I'll be rambling on about Chinese food. There will also be restaurant reviews, mostly London based. Although many of the early posts will include dispatches from my recent trip to China. It's early days but I'd love to hear from you as soon as I get some proper posts up.